John is an ex-Royal Air Force Qualified Flying Instructor (QFI) with tours on Buccaneers, Tornado GR.1's and also Hawk T.1's. 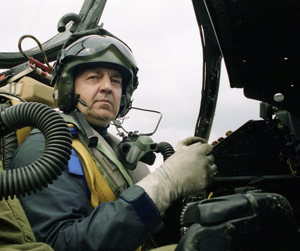 He saw active service in the 1st Gulf War as part of the RAF's Tornado force. John is currently employed by BAE Systems based at Warton as a Hawk QFI, which is a small team of instructors that train fellow pilots using a small number of former RAF Hawks in preparation for overseas deployments. He also provides fast-jet refresher training for experienced pilots that have recently returned from ground tours. John cites the Hunter as his favourite aircraft. Landing and takeoff may be incorporated into display.